The year is 1918 and 2 soldiers are in the trenches with a wounded officer. The soldiers names are Alf Stokes and James Twelvetrees, the officers name is The Hon. Teddy Meldrum. Alf thinks the officer is dead and steals the stone out of his ring, much to the disgust of the upright James. It turns out that the officer isn't dead and Alf and James end up saving him. We then move forward 9 years to 1927 and James is now the Footman for Lord Meldrum, but Alf and his daughter Ivy have fallen on hard times, doing a knife throwing act. Even this doesn't last as they are to be replaced by Joe McVitie and his educated Poodles. Alf decides to go back into service as butler, and ends up at Lord Meldrums, to the displeasure of James. 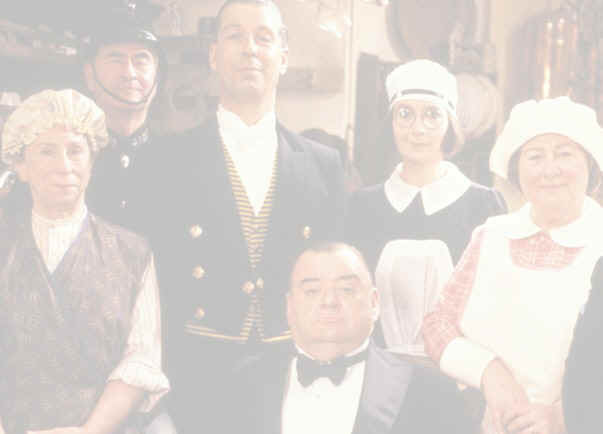 Alf manages to get Ivy a job there as a parlourmaid, much to the pleasure of Teddy who goes for her "shiny scrubbed face". Lord Meldrum, it seems is having an affair with Lady Agatha. Episode 2 : "The Phantom Sign Writer"
Episode 3 : "A Deed Of Gift"
Miss Poppy starts flirting with James, she says he makes her go all "wibbly wobbly", and James feels that he is being put in an awkward position. Meanwhile, Lady Lavender instructs her solicitor that she wishes to give her shares of the Union Jack Rubber Company to Ivy, which pleases Alf, but doesn't please Lord Meldrum for firm financial reasons or Mr Teddy, he thinks money will spoil her! Episode 4 : "Love And Money"
Lord Meldrum tries to get Lady Lavender certified for trying to give away the shares. Teddy doesn't want to give up chasing Ivy, no matter how dangerous it may be.The family throw a party for Miss Cissy and Ivy gets carried away talking. Episode 5 : "Fair Shares"
Lady Lavender promises the shares to Stokes, and not Ivy, but then gives them to Henry. Stokes tries to con Henry out of them, but is not as stupid as he looks. Alf then goes to the pawnbrokers to raise the money for the shares, where he took the stone out of Mr Teddys ring 9 years before. Ivy is in trouble for blabbing about Lord Meldrums affair with Lady Agatha. Episode 6 : "Beg, Borrow Or Steal"